During his successful run at Hyde, Bruce Campbell started at Maryland before playing three seasons in the NFL, Richard Kittrell was one of the state's most heavily recruited players 15 years ago before committing to Iowa while Martin Parker won a national championship at Richmond before spending time in NFL camps with multiple teams. On Thursday morning the Wilbur Cross High School football coach said that UConn commit Travis Jones, "could probably be the best (lineman) we've ever coached." Acquavita said that Jones is 6-foot-5 and 352 pounds and the starter for the Governors on both sides of the ball as a sophomore and junior who recently ran a time of 5.0 in the 40-yard dash. As a junior he had 45 tackles and a sack on defense and on offense he anchored a line that helped the Governors average 5.3 yards per carry. "I think the sky is the limit with this kid,' Acquavita said. "I think if he continues to grow, there is no telling what he can do on a football field. He is very good, a very talented athlete for a guy that big." Acquavita wasn't sure where the All-Area lineman projects to play at UConn. "I think probably offensive guard but nobody has ruled out the defensive side of the ball either," Acquavita said. Jones is the fifth member of the Class of 2018 from Connecticut joining the Capital Prep duo of Khyon Gillespie and O'Neil Robinson, East Hartford's Kevon Jones and Cheshire Academy's Dillon Harris. 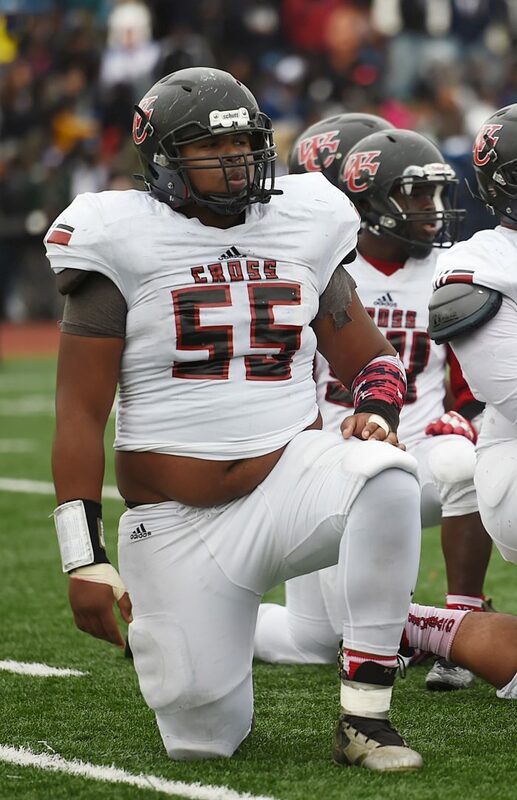 Jones is the first lineman among the known UConn commits in the current recruiting class. Here are some videos of a Wilbur Cross game I covered when Jones was a sophomore. "He had a good amount of offers and had some options," Acquavita said. "From the get go I wanted him to feel things out, meet the coaches and as it got down towards the end, he was asking me what I thought. I think to be part of a rebuild and be at the foundation level of a rebuild ... If this should take off and be something special, to be an in-state guy and be a part of that could really be a great thing for him to be a part of that and be a face of a program that is in the rebuild process. The support system of having coaches, family and everybody here right at your fingertips for anything you need is kind of a nice feeling." Jones' senior season begins on Sept. 9 when Wilbur Cross plays at Foran.